A recent announcement by SpaceX’s eccentric CEO detailed the company’s plans to take humanity into outer space in passenger rockets for the first time. Elon Musk’s latest business plan includes ferrying people to the Moon, as well as to Mars, so that these lucky individuals can lay the groundwork for bases and colonies far away from Earth. These missions will be completed using SpaceX’s newest craft, the BFR (in development at this time). The BFR will be a re-usable rocket, one that can land safely and effectively, then be used to take off again. The BFR is being designed as an improvement on the company’s existing Dragon and Falcon craft. These are cargo transports in use at NASA and a smaller re-usable rocket, respectively. The BFR and its ambitious programme of launches are a final piece in the puzzle of how Musk intends to achieve his extra-terrestrial dreams. SpaceX have also presented other innovations that should streamline the journeys to their remote destinations. One of these is the revolutionary spacesuit the company claim to have already developed. SpaceX’s new protective suit, presumably to be worn on or around its crewed rockets, is depicted as a sleek, streamlined white one-piece with slightly stylish accents. It is a considerable departure from the traditional image of a spacesuit, which has required heavy hardware and attachments such as life-support systems up till now. Spacesuits used by the astronauts on missions such as those of the International Space Station (ISS) are made up of a number of layers, so as to protect the occupant from the effects of exposure to the vacuum of space. Many people working at organisations such as NASA agree that slimmer suits, as well as materials that can consolidate all the necessary protection into thinner fabrics, would be far preferable to the current spacesuits. This would improve the mobility and flexibility with which astronauts can move in outer space. Thinner suits could also reduce the time and effort it takes to put a suit on (which has been historically extensive) and to prepare for space travel, which includes adapting to the rigours of wearing a typical spacesuit. However, SpaceX does not appear to address these aspects of preparing for extra-terrestrial life with this new spacesuit, which was showcased on Instagram on August 23, 2017. 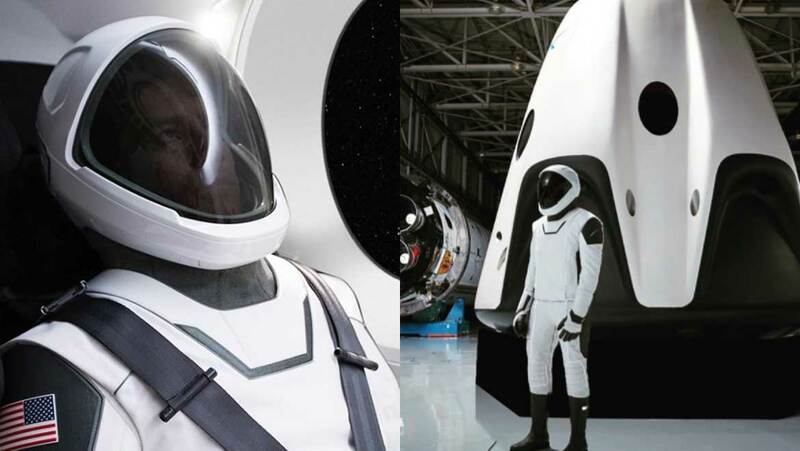 SpaceX’s new design is a relatively simple white jumpsuit, which attaches to a matching helmet with a tinted visor. However, it is shown in the company’s official images as something to be worn inside a passenger module, not outside a ship. Some sources say that it is intended for wear inside human flight modules only, or during transfers to other locations in space such as permanent stations. Therefore, there may well be other new SpaceX designs with actual excursions into outer space, such as Extra Vehicular Activity (EVA), in mind. The image that SpaceX has released does look a little edited, set against a background that depicts the ‘porthole’ of a futuristic cabin. However, Musk claims that the suit as shown is a completed product and not a mock-up; and that its ‘model’ is a real-life SpaceX engineer. He also asserts that the suit is also fully functional, having been “tested on Earth”. When might we see the spacesuit in action? SpaceX’s new spacesuit would go well with its next new venture: a new form of the Dragon craft that can ferry crew to locations such as space stations. The company has been commissioned to build this ship by NASA. This organisation has been dependent on Russian rockets to bring U.S. astronauts to the ISS for some time. The new Dragon crew-transport module would thus bring NASA’s crewed flights back ‘in-house’. It is estimated that this new craft will be used in upcoming launches as early as 2018. On the other hand, the crewed Dragon has not yet seen a public debut. There are images, however, that appear to depict a crew member in the SpaceX suit standing outside a vehicle that could be the new passenger-carrying rocket. This image also reveals more details of the suit itself, mostly in terms of what the boots and gloves of the suit could look like. The boots are black or dark grey, and do not look hugely different from conventional wellingtons. However, it’s not much of a stretch to imagine that these boots have rather more high-tech properties than typical rubber boots. The gloves, on the other hand, are thick and purposeful-looking, and are more in line with the equipment to be expected when embarking on an off-world mission. Elon Musk has outlined highly ambitious plans for the next generation of his SpaceX rockets, which are also to be completed or implemented in a remarkably short time-frame. For example, the BFR is prospectively scheduled for its first launch in 2022. SpaceX has also re-designed the inter- and intra-vehicle spacesuit, to give it a more streamlined, ‘modern’ look. We may see real-life versions of this new suit as early as 2018, when it might be worn by the crew of the new Dragon-class transport. The actual practical properties of the suit, such as how they have been designed or adapted to help the wearer cope with long-term space flight, have not yet been detailed. On the other hand, this additional detail of how SpaceX intends to outfit actual crew lends a little more credence to plans that some find overblown and over-reaching. However, it can’t be argued that the company are constructing an increasingly convincing image of the company that is finally going to take humanity further outwards into the solar system.